As I promised Friday, I have a super exciting review for you guys today. About a month ago I was contacted by the amazing and talented Paul Angone of All Groan Up to be part of the launch team for his first book, 101 Secrets For Your Twenties — a hilarious, yet serious and thoughtful book about what your twenties are all about. He used his own struggles through twentysomething-hood (he just crossed over into thirtysomething-ness) to help other twentysomethings realize that (A) they aren’t alone in their struggles and (B) it’s OKAY to have struggles. Today, I wanted to tell you all what I thought about the book and whether or not I think it’s worth a buy. Spoiler alert: I loved it and it is. Note: As is my style, this review will be very informal and unstructured. There are a ton of reviews out there (Full disclosure: I didn’t read them because I didn’t want them to influence mine!) that you should check out for even more information about the book. Just buy it, I wouldn’t steer you wrong. 101 Secrets For Your Twenties contains…wait for it…101 secrets for life in your twenties. I counted. Also, each secret has a number. Like many of us, Paul woke up one day and realized he was dissatisfied with the direction his life was headed. He didn’t feel successful — he had a job he wasn’t passionate about and he didn’t feel as though he was making an impact. He got fed up with all of it and decided to find the secrets to doing twentysomething-hood right. It’s not a new story, but it’s a story that many of us twentysomethings (and thirtysomethings and fortysomethings) can relate to. And it’s an honest story to boot. Paul has been kind enough to publish what he found out about twentysomething-ness for the rest of us struggling with the same feelings of “What Now?” that he struggled with. It’s entertaining as hell (check out the caffeine quadrant and the descriptions of the different types of awkward coworkers for some serious laughs), it’s honest (real talk about marriage not fixing any problems and the necessity of change to thrive), and it’s full of practical advice (like when NOT to look at Facebook and how to make and keep friends as a twentysomething). Without giving away the entire book (which is difficult, because I highlighted like three-quarters of it), let me go through some of my favorite parts — both quotes and secrets. Some of these are finance related. Most are just about life in general. There are far too many good ones (like 101 of them) so I will just list my top 5. Secret #36. Your 20s might be less about finding out what you want to do, and more about finding what you DO NOT want to do. Secret #58. Everyone is too busy putting a PR spin on their own lives to care too much about yours. Secret #60. Our 20s are not about finding home; our 20s are about finding the right place to build it. Secret #73. The biggest risk of your 20s would be never taking any risks at all. Secret #85. Never looking at your budget and never making a budget is the exact same thing. Secret #17. Every time you write a rent check, an angel loses its wings. My favorite part about this book is that a year ago I would have told you I didn’t need it. I have a tendency to be a bit…cocky. I’m sure I hide it well. If you would have asked me to read this book a year ago, I would have scoffed. “I don’t need that. I’m a pro at twentysomething-ness.” And I thought I was. I was making almost $50k straight out of college with decent benefits and a 401(k). I was (and am) in a great marriage. While I have a lot of debt, I have never paid a bill late in my four years of twentysomething life. I left my silly insecurities behind in my teenage years. What do I need to learn about being a twentysomething? Well, then I started freelance writing. Found out that you don’t actually have to hate your job to get paid (this sounds obvious now, but it wasn’t then). Quit my comfortable job. Decided to move across the country with whatever will fit into my car to a state I’ve never been to with absolutely no career plans. And all the sudden, I don’t have everything figured out anymore. Turns out, I never really did. I just understood the status quo and figured that I would resign to a life of ordinary. Oh the things that can happen in the course of 365 days (five hundred twenty-five thousand six hundred minutes!). 101 Secrets For Your Twenties by Paul Angone is a great book because NO ONE has it all figured out. As Paul puts it, “This twentysomething shoot ain’t easy. It’s a decade exploding with intensity and ambiguity. Anxiety and excitement. Purpose and pointlessness. Answers riddled with questions. Paradoxes mixed with 100 percent certainties. There are so many “firsts.” So much change. So many “what ifs, what nows, and what the hecks.” Even if you think you know everything you need to know about being in your twenties, chances are you don’t. Very few people are pros at finances, relationships, faith, career, and just general grown-up-ness. We could all use a little help from someone who has actually been there. In conclusion, you should buy this book (have I mentioned that yet?). It’s smart, well-written, funny, and honest. Paul is the bee’s knees. And while I’m sure you are awesome at being a twentysomething, I bet even you could use a little extra guidance. READ ALL 204 PAGES OF AWESOME. You can thank me later. Or now. I like praise. BUY IT HERE . OR HERE. If you buy it and email Paul a copy of the receipt (paul@allgroanup.com) before July 11th, you will be entered to win an iPad mini. Um, awesome! Do that. Paul has been nice enough to give me two copies of the book to give away. Don’t worry, I’m not going to make you follow 491 people on Twitter and promise me your firstborn. Just leave a comment below with your own secret for people in their twenties. This giveaway will close on Monday, July 15th at 5 PM EST. I will choose two winners at random on Tuesday, July 16th. If you want to comment, but do not want to be entered into the giveaway, (A) what’s wrong with you? and (B) please specify that in your comment. I would say a major secret to life in your 20’s is to start your 401(k) or 403(b) as soon as you can. I wish I had known that when I was younger. Even if all you can do is $20 a paycheck, with the magic of compound interest, you’ll need so much less money to invest if you start early. And if you work in a job without it, find a low starting balance Roth IRA to get that sucker going. Is this open to Canadians? I’ll leave a comment anyway. I think my secret would be that you can’t sit around and wait for your dream job to come… you have to do things that will help it come to you. No matter what happens, no matter how hard things seem, life goes on, and so will you. Hmmm…so many life secrets. I think I will go with the fact that you should not take unemployment as something horrible. It can be tough to get a job right out of school at first but use your free time as an opportunity to travel and see the world. You will learn more about yourself that way. Truly enlightening. I’m completely honored by this amazing review Erin. Haha, I don’t know about that, Paul! Thanks :). I love your review! My secret for twentysomethings would be to not let life pass you by. 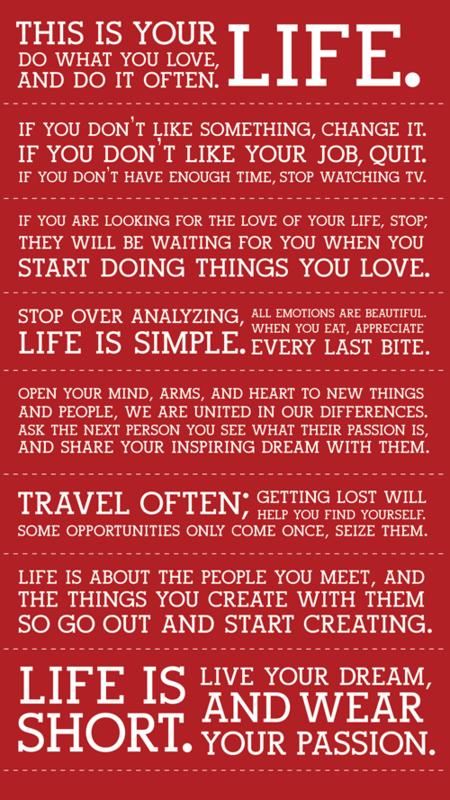 I agree with #60 and #73 – that your 20s are a time to take risk and find out what exactly you want out of life. You should take as many opportunities that come your way as possible, because things don’t fall into your lap. Before you know it you’ll be in your 30s, possibly with a family, wishing you had done so much more. Don’t take your 20s for granted! Great words of advise! I’m glad I’m not so alone not knowing what I’m supposed to do with life. My advice for people in their 20s is not to worry about not knowing what you want to do for “the rest of your life”, I have friends that are almost 30 and still have no idea what they want to do! I have seen quite a few friends go to school and get degrees that they don’t even use! So now they have a massive amount of student loan debt and have no plans to use their degree. Take your time to figure these things out, and don’t be afraid to change your mind a million times! Life is like riding a roller coaster, enjoy the ride! Life throws at us a lot of unpredictable ups and downs. Sometimes you’re soaring sky-high and the next minute you’re diving deep under water or heading under ground. I don’t know if it is much of a secret, but a former boss of my wife told her “if you are single or married without kids, there really is no reason you can not leave the country once a year if you want to.” I tend to agree with this statement, but of course I can think of one reason why you couldn’t do it, crippling debt. Of course we are lucky and don’t have that so we leave the country once a year and have continued to do so even with a little guy in tow! PS. I don’t really want to win the book, I just wanted to share that nugget. My secret as a current twenty-something is to simply never stop learning! You might not be exactly where you want to be, but we can even learn from the bad experiences – all of this will lead us the a better place! Waiting to read all the reviews until after I write mine. I don’t want to be influenced!!! My secret would be that dreams change, and they do so often, so don’t freak out when they do! Instead, embrace it! Haha you’re welcome, Katie! I hate those giveaways! I’m on the later end of a twentysomething but still feel like I’m in the thick of it! My two cents would be to approach all situations in life, the good, the bad and escpecially the ugly with Gusto. You’ve got to be intentional. Happen to life instead of letting it happen to you. But also, “It happens to the best of us”. “It” being the quarter-life “I have no idea what I want to be when I grow up” and “I just need to find myself” crisis. Man, I went through this big time and didn’t realize it was somewhat normal until I started reading all these blogs! I was too serious… focused on not being in debt and saving every extra penny… so my advice would be to remember you are still young and let go and have fun a little! My advice is…well, I don’t really have any. Isn’t that why I’m entering this contest? So I can read what I need to do?? Can I be entered without any sage advice to give, pretty please? I’ll enter you in the giveaway, Manda! Good luck :).